Audax nationally and regionally relies on the support of volunteers to fulfill the various operational roles to keep the wheels spinning. If you have a desire to assist, consider nominating for a place on the club committee, either state or national. Unsure about whats involved?? Contact a committee member to learn more. From Russell Noble, National Secretary and Returning Officer. As returning officer for the election of members of the National Committee I am informing the membership that within the standard deadline prescribed in the constitution 17(a) nominations have been received only for the Vice-President and one General Representative position. As such the provisions of 17(b) allow nominations for vacant positions to be received until 20 days before the AGM. Nominations will be accepted for the President, Secretary, Treasurer and 3 remaining General Representative positions until January 18th. Nomination forms and links to position descriptions can be found in the AGM Notification on the website. The meeting minutes from the 2018 AGM have been added to the AGM Notification on the website. If you are intending on attending the AGM you must register in advance. The link to register is also in the AGM Notification. The Queensland AGM will be held at the Nundah Criterium Track 09-Feb-2019, preceded by a gentle 50km ride. The ride departs 7:00 am and the meeting will commence 10 am. Keep an eye out for more information in the weeks ahead. The driver who struck and killed cyclist Cameron Frewer on the Sunshine Coast late last year has been charged after after it was revealed he was allegedly high on drugs at the time. The matter goes before the courts next week. Up in the north, seventy-six eager cyclists took on the weather for this annual ride under increasingly darkening skies and a cyclone in waiting off the coast. What could possibly go wrong?? This ride is almost certainly the first supported Audax ride anywhere in the world every year. Always popular, this year’s ride had in excess of 40 starters and an improved course that put the gateway climb first. A huge thanks to RO’s Simon and Vaughan for an excellent day out. A thing that had never crossed my mind until recently was need by some for attention to and maintenance of the posterior bicycle contact point. I’ve heard discussions about the search for the right saddle, the right knicks and so forth, but until now lacked a true appreciation for why this attention to detail is so vital. Read on. And take care down there. I am sure we all prefer descending to climbing. Watch how the professionals do it and try not to panic as Nibali shaves the wall at speed. Someone catches some air and Cancellara is just superbly in control. Sagan of course is Sagan, and so does it his way. As I recall Geraint Thomas went off the road on this descent during the event. Not for the faint of heart or marginal of bike control. A scenic ride around the Lockyer Valley passing through Rosewood, Laidley, Ma Ma Creek, Gatton and Glenore Grove on quiet roads with a few hills. The iconic Brisbane Saturday morning ride. The front, the back and the Gap Ck loop. (With time left over to mow the lawn in the afternoon). Not the Alpine, I hear you say. Riders will not be short changed on either scenery or elevation. QLD does it better. A scenic hilly 200 that will give you plenty of excuses to get off your bike to take a photo or two. Dayboro and Mt Mee with a few dirt roads and 4500 of vertical gain. What else could you ask for? The only way is up! Time: 8pm Australian Eastern Summer Time – please be sure to adjust to local time. The AGM will be held online with conference facilities in each region. Registration is required to allow appropriate rooms to be booked. For registration please choose the region you will be attending. If you are not in a listed city please choose ‘Other’. Access to the conference lines will be provided to validated and financial members. To register for this the meeting you must login to the portal. 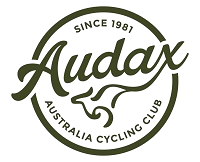 The login is the email address you used when joining Audax, and the password you selected. If you’ve forgotten your password you can reset your password. Great start to the year Keith! Love the ride reports: “…more complicated than Jacques Anquetil’s love life.” of D Booth; your veloview of “that hill” and the lead pic in Rudolf’s Revenge are highlights.